USB has become more than a way of connecting devices to a computer with plug-and-play ease and performance. It has also become the method of choice to power and charge a huge range of portable battery-powered devices like cell phones, tablets, USB battery packs, handheld game consoles, e-readers, e-cigarettes, cameras, smart watches, fitness trackers, bicycle lights, and many more. Unfortunately, USB charging is not well standardized and in the car on the go most people need to have an expensive dedicated car charger for each of their mobile devices. Often only one device can be charged at a time due to not enough 12V accessory sockets and keeping separate chargers for each device can clutter up the car interior. The USB-C3C can help solve these frustrations by offering three dedicated USB smart charging ports in one compact drinking cup sized package to tuck away cleanly and securely in the car cup holder. Three 2.4A smart charging ports which are capable of automatically selecting the best charging method for the device attached for several additional charger types, including USB-IF Battery Charging Standard (BC 1.2), and special signals for Apple 1A, 2.1A, 2.4A and Samsung 2.4A chargers. Up to 36W (7.2A) total power to share between all 3 ports. Enough power to charge three iPads at the same time. 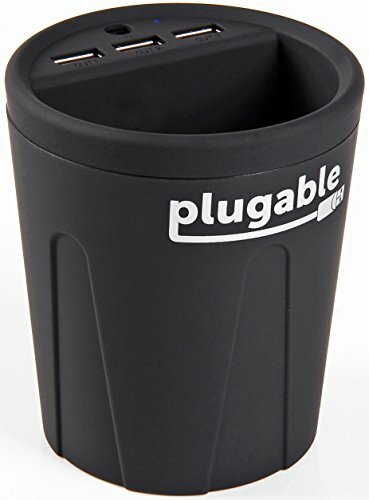 The Plugable Power Cup USB smart charger was designed to fit nearly any car or truck's drink cup holder and be powered off of any standard 12V automotive accessory socket (cigarette lighter). Charges up to 3 devices at the same time, perfect for vehicles that don't have a built in USB charger or when the whole family needs to charge on a road trip! The smart charging cup can provide a powerful 36 watts of power across its 3 USB ports for rapid charging of your mobile devices. It also has a small storage compartment for tucking in loose charging cables or holding small cell phones (like an iPhone 4), eye glasses, pens/pencils, loose coins, E-Cigarettes, etc. 5FT power cable included. Charges almost all Apple iOS, Google Android, and Microsoft Windows Mobile devices. Small Windows tablets like the Dell Venue 8 Pro are also supported. Three dedicated smart charging ports that automatically select the best charging mechanism for the device (Apple 1A, 2.1A, 2.4A, Samsung 2.4A, Android, BC 1.2). Can supply up to 36W (7.2A) total among all 3 ports for rapid device charging.